About 25 cyclists turned out for the Tysons bike planning meeting tonight at Kilmer Middle School, despite the heavy rain that flooded some local streets. We hope to have more info about some of the draft proposals presented at the meeting, and we'll post it on the FABB Tysons bike plan page. Dan Goodman of Toole Design gave an overview of the project and Bob Patten of Toole filled in some of the details. 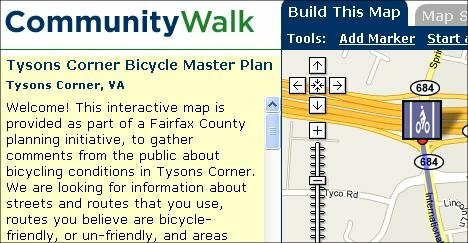 This interactive map is provided as part of a Fairfax County planning initiative to gather comments from the public about bicycling conditions in Tysons Corner. We are looking for information about streets and routes that you use, routes you believe are bicycle-friendly, or un-friendly, and areas where you think improvements are needed. The comments will be gathered and used in the planning process that is underway to develop a Bicycle Master Plan for Tysons Corner. Cyclists then broke into smaller groups to mark up maps with suggestions. Not sure how well that part of the meeting worked; there were lots of ideas but it seemed like many were not captured by the project team. 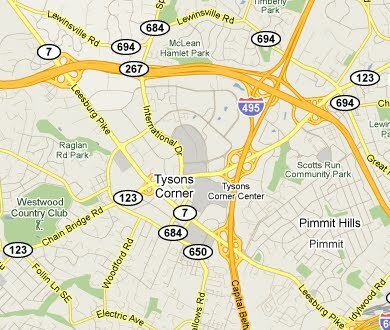 Using the Community Walk interactive map is probably the best way to comment on what you think is needed in Tysons. 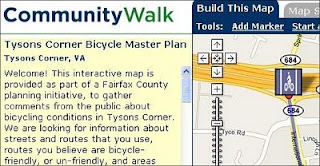 Also check the Fairfax County Bicycle Master Plan page for more info. 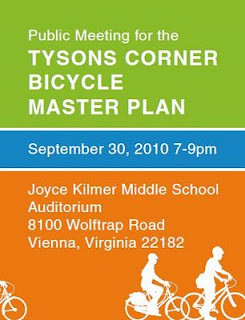 A reminder that the first Tysons bike plan meeting is tonight, Thursday, Sept. 30 from 7-9pm at Joyce Kilmer Middle School located on Wolftrap Rd near Gallows Rd (see the Tysons bike plan meeting flier). It was good to see an announcement about the meeting in the Local Digest section of today's Post. If you plan to bike there, find a route using the Fairfax Co bike route map. If coming from the west, Wolftrap Rd is very bike-friendly and you can check out the new Wolftrap bridge just west of Kilmer MS (and I hope it's not slippery when wet). This morning at Interbike in Las Vegas, the League of American Bicyclists awarded WABA a Gold Bike Friendly Business award. These awards are given out twice per year, and the Fall 2010 award class includes one platinum, three golds, twenty-seven silvers and thirty-one bronzes. We’re extremely proud to be recognized by the League for all of our hard work and we want to congratulate all the other awardees-especially our fellow DC-area recipients! We also recently rode our first Capital Bikeshare (CaBi) bike in Crystal City during Car Free Day. The bikes look very sturdy and are great for getting around town. The density of stations in Crystal City seemed very good and it looks like the system there will be a success. It's a great accomplishment to have a system that's compatible in two different states (oops... a state and the District of Columbia). 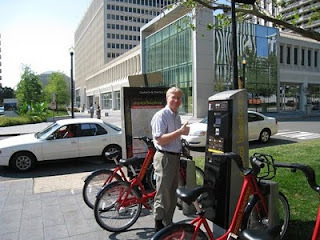 Here's our latest CaBi story: When we had a meeting downtown this week we took Metro and wanted to test out the bikes again. We exited the Orange line at Foggy Bottom and planned to ride the bike to the McPherson Square area (don't tell anyone I didn't have a helmet with me). At home I had looked at the map of current stations and saw there was one near the Foggy Bottom Metro station. When I arrived, I whipped out my iPhone, pulled up the map from the CaBi site and .... couldn't see a thing. Well, I could see a few streets and what looked like station symbols but couldn't read the street names and the map navigation was very hard to control. I ended up walking from Foggy Bottom, along K Street, all the way to 16th St and saw no stations; no CaBi stations that is. There were two SmartBike stations but they didn't do me any good. I was told there is an iPhone app for finding stations, and after some searching just came across iFindBikes, a free (for now) app: "iFindBikes is the ideal tool for users of city bike rental around the world. iFindBikes shows you where are the bike stations around you and how many bikes and docks (parking slots) are available." Guess I'll study the online map a little more closely before heading out next time. I'll also check out iFindBikes. Fairfax County is hosting a meeting to discuss bicycling in Tysons. The meeting is this Thursday, Sept. 30 from 7-9pm at Joyce Kilmer Middle School located on Wolftrap Rd near Gallows Rd (see the Tysons bike plan meeting flier). This meeting is part of the Tysons bicycle master plan process. Planners want to solicit input from cyclists on what bicycle facilities are needed in Tysons. The goal is to allow more people to use bicycles for transportation and recreation in the future. Tysons is not very bike friendly now, but with plans for another 85,000 residents living in Tysons in mixed-use, transit oriented developments located around four new metro stations, many more people will want to get around by bike. This is the first phase of a process for developing a bicycle master plan for the entire county over the next year and half. Cyclists are encouraged to attend the meeting and let the county know what you need. Dr. Gridlock recently wrote about the planning effort: Fairfax looks at bike plan, and the county just published the Fairfax County Bicycle Master Plan page with info about the Tysons planning effort. See the FABB Tysons bike plan page for information we've collected on the Tysons bike planing process. Fairfax Co Adult and Community Education is offering a bicycle skills class this week, Cycling With Confidence! (LAB Traffic Skills 101). I will be teaching the class on Tuesday evening and all day Saturday at Chantilly High School on Stringfellow Road. Register online. To find out more about the classroom portion, visit the Traffic Skills 101 online course. Why should someone who has been riding a bicycle for many years want to take a bicycle skills course? Many people don't feel very safe riding with traffic, especially on busy main roads with higher speed limits. Through the use of "effective cycling" techniques, cyclists can learn to control traffic by using effective lane positioning techniques. With practice these techniques become second nature. They improves cyclists' visibility, both between and at intersections. Cyclists also learn how to avoid dangerous situations by practicing various skills such as the quick stop, rock dodge, and instant turn. These skills could save your life. No one spoke out in opposition to the proposed bike lanes at the Telegraph Rd public hearing held last Thursday. 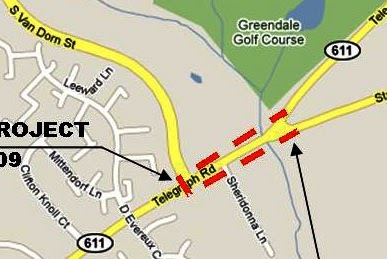 The VDOT project that includes a segment of Telegraph Rd between S. Van Dorn St and S. Kings Hwy. Some concerns were expressed about the proposed design that places the bike lanes placed between the through lane and the long right turn lane. However, as Supervisor McKay stated, regardless of the final design, there are now provisions for on-road bike facilities on the road. One suggestion that was floated was to keep the bike lanes to the right of the right turn lane, then have a bike box at the Telegraph Rd/S. Kings Hwy intersection to allow cyclists to move left to continue straight on Telegraph Rd. While the bike box may work OK when there is a red signal, when there's a green signal bicyclists would be forced to take the lane and make an awkward movement into Telegraph Rd traffic at the intersection. At the meeting one of the project team members was showing a simulation of traffic along this section of road. Unfortunately it did not include bicycle traffic, an all too common problem with traffic models. We think it's time that bicycle traffic be given equal status with motorized traffic when it comes to all types of transportation modeling, especially in urban areas. Seeing the flow of bicycle traffic with different configurations would be a great asset in developing the final design. Fairfax County recently posted a job announcement for the Director of Transportation. The current director, Kathy Ichter, has been in the position since 2006. The closing date for the job posting was September 10. We've heard no official word on whether Icther will be retiring. We've complained about the fact that there is not detour being provided. Many people use the bridge to get to work and they have few options. We've also asked for signs at the park entrance, not just at the bridge. Does anyone know if there were signs placed on the approaches to the bridge near the park entrances, north and/or south? Were the signs in Spanish and English? We celebrated Car Free Day today at one of the Capital Bikeshare stations in Crystal City. We had a table with copies of the Advocates Guide, county bike maps, and example drawings of road projects. The station at 23rd St and Crystal Drive is one of 14 in Crystal City (see the station map). The density is good, with stations located along Crystal Drive, several around the Crystal City metro station, two near the Pentagon station, and others scattered around the main commercial and high density residential areas. We were there with the BikeArlington folks from 11:30-1:30 and there was a lot of lunchtime foot traffic. Several people tried out the bikes; they are so new that many people hadn't seen them before and were intrigued. While we were getting set up two people dropped off bikeshare bikes, saying they planned to use them on a daily basis to get from the Metro station. It's about 1/3 of a mile from the station and one woman is recovering from an injury and the walk is painful; the ride is a much better option. Once you're a member, any rides under 30 minutes are free. The system is not without it's problems. One gentleman from Wisconsin, pictured on the left, wanted to try out the system. He's are regular cyclist in Madison, a Gold level Bike Friendly Community. He wanted to ride to the Mall and check out some museums. The printed map (and the Google map showing all the stations) showed two stations on the Mall and others nearby. The map of current stations tells a different story, and unless you've checked it out in advance or have a smartphone, you have no idea which stations have been installed. As of today there are no stations on or near the Mall. And the system is so new that several people he asked couldn't help find a station. As a result, he rode all the way back to Crystal City, taking a much longer, and more expensive trip (and missing out on seeing the museums). The cost of the trip increases greatly after the first hour. That's one of the negative aspects of rolling out the system without complete coverage. The system status is changing daily, so it's difficult to post the latest maps, but there could be a better way to help users find current stations. 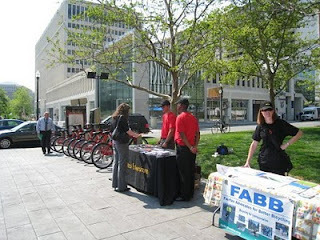 We talked to several people about the new advocates guide and handed out Fairfax bike maps. 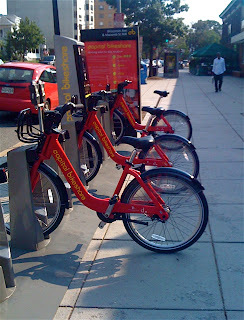 It looks like Capital Bikeshare will be a success. Many people were excited by the idea and once the word gets around that it's easy and inexpensive to go by bike, there will be a demand for more bikes and more stations. I interviewed my subject [Antoine] for a couple of weeks and got his story of how he traveled across the country on his bicycle. In addition to taking this trip he began to spread his passion for cycling to others through an art event centered around bikes. This is my first attempt at making any type of film. The art event was Biketastic! an art exhibit and benefit for Bikes for the World that Antoine organized this summer. Bike Story from Colin Redick on Vimeo. While bike sharing has been available in DC since 2008 when Smartbike DC was launched with 10 stations and 100 bikes, a new system, Capital Bikeshare, opens today with 114 stations and 1,100 bicycles. The key to successful bike sharing is having a critical mass of bikes and stations so users can count on finding bikes, and places to park them, for most of their short trips. While 114 stations isn't nearly enough to cover an area the size of DC and Arlington, it's a great start. As The WashCycle says, "things will never be the same again." Dan Malouff is right, "Bikesharing is going to be awesome." It will be the biggest thing to happen to area transit since Metrorail opened. It will change travel patterns and attitudes. It'll be good for the economy and public health. The DC region has seen a steady climb in bike commuting from 1.26% in 2005 to 1.63% in 2008. That number could double in a couple of years and then double again before mid-decade. We'll see the percentage of trips - already as high as 5-7% in some neighborhoods - go up even farther where Capital Bikeshare stations are located. Metro usage could see a bump as well, as Capital Bikeshare is a perfect compliment to rail/bus transit. We'll get a chance to check out the system on Wednesday. FABB plans to have a table at the Carfree Day event at the Crystal City Capital Bikeshare station located at Crystal Dr & 23rd St S. See the Capital Bikeshare station map. We'll have copies of the Guide for Reviewing Public Road Design and Bicycling Accommodations for Virginia Bicycling Advocates. Tyler Farrar wins final stage of Vuelta a España—Tyler Farrar won his second stage of the Vuelta a España, which ended today in Madrid. Tyler came from behind to pass Mark Cavendish and win the finishing sprint.Vincenzo Nibali was the overall winner. Ben King of Charlottesville area wins pro road title in Greenville, SC—George Hincapie was trying to defend his title as the US road champion in the event that was held in his home town, but 21-year old Ben King (in the photo on the right) broke away early and held off the pack to win. It was a big day for US road cyclists; any bets on whether the news is covered by the Post? I wanted to keep you apprised of my efforts after the recent tragic death of Rebecca Johns. Senator Barker, Delegate Sickles, and I have sent the attached letter requesting safety improvements along Franconia Road to Governor McDonnell. It’s not enough to only regulate traffic; we also need safety measures for pedestrians and bicyclists. There is a long history between the Virginia Department of Transportation and the community regarding traffic control and the safety of pedestrians and bicyclists, as well as motorists along Franconia Road between Rose Hill Drive and Telegraph Road. Since the accident, we have received many suggestions for safety improvements in this largely two-lane section of Franconia Road. We are not traffic engineers and need your assistance to evaluate these suggestions. We do know this section of Franconia Road to be quite congested. The road is a primary residential thoroughfare and fronts heavily used athletic fields, churches, and a middle school. While there are some sidewalks and trails there are no crosswalks, making it treacherous to cross the road. We thank you for your time and attention to this critical matter. We look forward to hearing whatever suggestions you find may be appropriate and stand ready to assist you in sharing this information with the community. Recognition of Fairfax Advocates for Better Bicycling(FABB): For their work on the completed Guide for Reviewing Public Road Design and Bicycling Accommodations for Virginia Bicycling Advocates, outlining ways bicycling proponents can get involved in the process of designing, and building roads to ensure that bicycling accommodations are integrated into the plans where needed. When Captain Bennett (the commander of the Franconia police station) called me from the scene of this terrible tragedy I experienced every parent’s nightmare. This accident is a tragedy not only for the immediate family, but also for the community. I’m not a traffic engineer. It may be that a signal would significantly slow traffic or it may be that we need a different approach. Because roads in most Virginia counties are under the control of the Virginia Department of Transportation, I am working with Delegate Mark Sickles and Senator George Barker to direct VDOT to take another more in-depth look at this issue and to identify improvements that may specifically address pedestrian and bicycle safety. I drove to the accident site to try to visualize what happened and also visited the site with the police to get their recommendations and discussed the speeding issue with them as well. I noted that the section of Franconia at Cannon is relatively narrow and I can see why bicyclists or pedestrians would think it safe to cross there. I’m not sure that a signal would have helped. Although it appears speed was not a factor in this particular incident you are absolutely right, we have a serious systemic problem regarding speeding in Fairfax County. I have a three year old daughter and I fear for her safety as I look out in front of my own house and see cars going well over the speed limit. We have been working on some pedestrian safety enrichments in this area including two Fairfax County Franconia Road Walkway projects that will install sidewalks along the north and south sides of Franconia Road from Governor’s Hill Drive to Telegraph Road. These projects are proceeding with land acquisition. On Wednesday of the week of the accident I spent part of the afternoon walking through the accident site and vicinity with the police and am working with the state officials to review and identify safety enhancements. As I have additional information or news, I will keep you and your community informed. As we struggle to move forward from this tragic incident, it was heartwarming to see the outpouring of support from the community as we gathered together at the candle light vigil that was held in the Wilton Woods Garden. In response to the recent death of Rebecca Johns, the 9-year-old girl who was killed while riding her bike across Franconia Road, Fairfax County Police and Trails for Youth are holding a bike rodeo on September 25 starting at 9am at Clermont Elementary School, 5720 Clermont Drive, Alexandria. Bike checks will be performed and several kids bikes will be raffled off. See the bike rodeo flier. 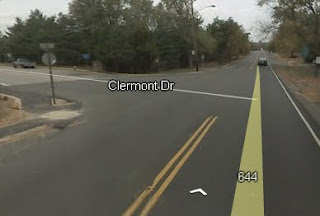 Rebecca lived on Clermont Drive. Update: On the same day, Saturday the 25th, a Bicycle Safety Clinic will be held from 2-3 p.m. at 6400 Nativity Lane, Burke. A Fairfax County Policeman and a Registered nurse will speak about the safe way in which to handle a bicycle. For ages 7-11 with adult. Free. gsbikesafety@gmail.com. Below are comments we submitted today regarding the design of the Phase II Silver Line stations, extending from Reston Parkway to the end of the line at the Route 772 station. bicycling is a low-cost, efficient way to get there. Covered, secure, conveniently located bicycle parking is needed at these stations. Bicycle parking at the existing Orange Line stations is already beyond capacity as evidenced by bicycles being parked along fences, posts or any fixed objects. It's unsightly and an inconvenience for bicyclists not to have adequate parking. The cost is minor compared to auto parking and the benefits are greater. Bicycle access to the bicycle parking locations is important and should be considered in all station designs. The parking should be located near the station entrance, not at a remote location. Comments can be submitted until October 1. The HOT Lanes Project did not close the Wakefield Park bridge this week to raise the structure but we are on track to close it starting on September 20-24, weather permitting. We will post signs today or early tomorrow on the bridge and on the pathways leading up to the bridge advising users of this four day closure. We are updating our fact sheets today and will post those online and at the park. Please contact me if you have any questions. FABB will meet tonight at 7:30pm at Patrick Henry Library, 101 Maple Avenue East Vienna, VA near the W&OD Trail. All are welcome. We have two guests tonight, Frank Raiti, Advocacy Director of MORE, and Larry Marcus, who will discuss multi-modal traffic analysis. We'll also discuss the Telegraph Rd. project, the Wakefield ped/bike bridge closure, and other FFX bike news. This morning we heard sirens outside our window. We live near South Lakes HS where participants in the Reston Triathlon end their bike ride and begin the run portion of the event. Apparently a motorist pulled out into the road as a cyclist was racing down the street. The cyclist collided with the car and, after lying immobile in the road for a long time, was taken away by ambulance. Traffic is allowed on the roads during the event. Update: See the comments below. Attorney Doug Landau of TheAthletesLawyer.com, provides more information about the injured cyclist. Fortunately Dr. Allen Delaney of Commonwealth Orthopedics was at the scene and able to help. We'll try to find out more about the cyclist's condition. Update: According to the Reston Triathlon race director, the cyclist involved in the bike crash suffered a concussion but has been released from the hospital and is recovering at home. We hope for a rapid recovery. While September 12-18 is Bicyclist and Pedestrian Awareness Week, we think every week motorists should be aware that they share the road with bicyclists and pedestrians and to give them a brake. Go the speed limit, look both ways before turning right, and slow down if you see a bicyclist or pedestrian in or entering the road. This is a good opportunity to find out more about the Dulles Rail project. Changes are being proposed for several of the rail stations as part of the Phase 2 of the project, from the Reston Parkway station to Dulles Airport, ending at Route 772 in Loudoun County. 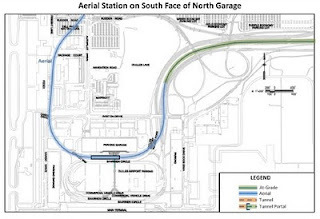 A major change at the Dulles Airport station would move the station exit much further away from the airport terminal. This is also a chance to ask about bicycle accommodations at these stations. 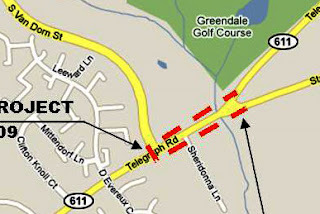 The Metropolitan Washington Airports Authority will hold two public information workshops to update the public on the latest design plans for the 11.6 mile section of Phase 2 of the Dulles Metrorail project which will be built from Wiehle Avenue on the eastern edge of Reston in Fairfax County to Route 772 in Ashburn in eastern Loudoun County. 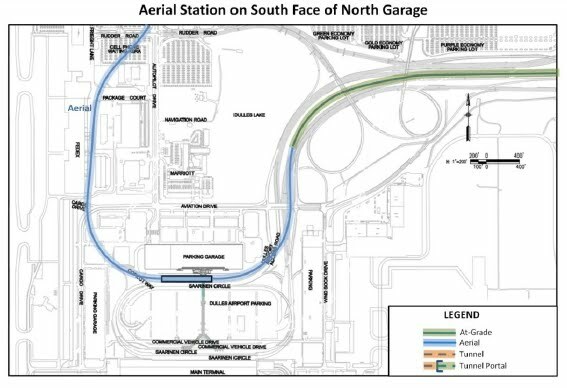 Information will be provided on the six future Metrorail stations in Phase 2, including an alternative option for the Washington Dulles International Airport station. The other five Phase 2 stations will be located near: Reston Parkway; Herndon-Monroe; Route 28; Route 606 and Route 772. The meetings will be held in open house format and will provide an opportunity to learn about and comment on the updates. If special assistance is needed, including a request for an interpreter, please call 571-265-2658 or TDD 711 by Friday, Sept. 10. Information on the latest plans for Phase 2 was made available on the Dulles Metrorail Project website, www.dullesmetro.com, on September 2. 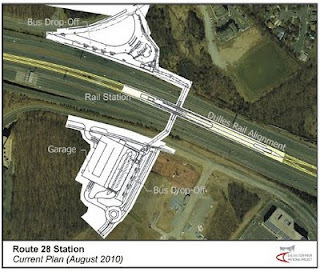 Comments on these plans can be made online by visiting the website, www.dullesmetro.com after September 2 by clicking on the "Phase 2 Information" section. Written comments may also be emailed to Phase2Comments@dullesmetro.com or mailed to: Dulles Corridor Metrorail - Phase 2, c/o Cordell & Crumley, PO Box 2562, Reston, VA 20195. The comment period ends October 1, 2010. Franconia Road should have a bike lane on both sides. This is a very unsafe road for children to walk to school on and I will make it my duty to pursue all I can in her name. In light of the recent death of Rebecca Johns in a bike crash, I am writing to request that something be done to help make Franconia Road more bike-friendly. While I do not regularly ride on the road, cyclists in the area tell me that it is a dangerous place to bike. Because of the nature of the neighborhood streets in that area, cyclists are often forced onto Franconia Rd to reach major destinations. Many cyclists ride on the road and yet there is no on-road space devoted to cyclists. 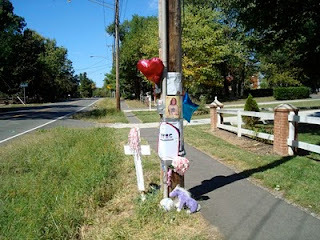 For cyclists like Rebecca who ride on the paved trail, there are few safe crossings of Franconia Road for them to use. There is nearly a mile between the crosswalks at Twain Middle School and Sable Dr, both unsignalized. This includes the stretch where Rebecca was killed. 1. Lower speeds - It's been shown that lower speeds result in fewer pedestrian and bicycle fatalities. Speed enforcement and traffic calming measures should be implemented to make the road safer. It's an outrage that police basically ignore speeding motorists unless they are exceeding the speed limit by 10 mph or more. 2. Bike lanes - Dedicated on-road space will allow cyclists a place to ride, could lead to narrower travel lanes that should help lower speeds, and be a message to motorists that bicyclists belong on Franconia Rd. 3. Safer Crosswalks - Existing crosswalks should have pedestrian-activated signals to help pedestrians and cyclists cross safely, especially at Twain Middle School. Additional crosswalks are needed between the two mentioned above. Anything you can do to help make users of Franconia Road safer is appreciated. Supervisor McKay has been a strong supporter of bicycling in the past. We're hopeful he will work with VDOT and others to make Franconia Road safer for bicyclists. 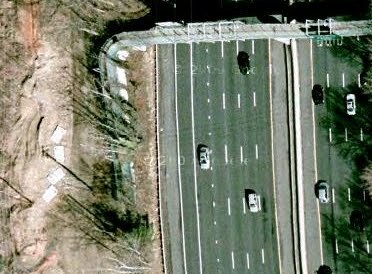 TheWashCycle recently posted an update as well that mentions an a story at TBD/ABC7 about residents complaints to VDOT about the safety of Telegraph Road. "It's been a nightmare," said Mary Kelly, who lives in the neighborhood. "People have complained for years about it - all along Franconia corridor - with no response from VDOT." Resident say there is no safe place to cross Franconia, which is the site of a park and two schools, and is frequented by children. Pedestrians and bikers only have a paved trail on the north side of the road to travel on. "There are some painted crosswalks, but I don't trust a driver to stop just to let me cross to the other side," said Matt Iden, another neighbor. Mary Kelly says she's complained to state legislators and VDOT for years but without success. "VDOT says it's really just a traffic problem," Kelly said. "'We don't have money to widen the roads and there's nothing the county can do about it.'" Kelly and her neighbors have begun an e-mail campaign, hoping that what happened to Rebecca Johns doesn't happen again. We're trying to find out more about the e-mail campaign to see if FABB can help. If you have more info, leave a comment or let us know at info@fabb-bikes.org. WABA's annual membership meeting, held last night in DC, was a chance for WABA members to meet Shane Farthing, WABA's new Executive Director, WABA staff, and the WABA board. WABA staff gave an overview of an impressive list of the many activities they've pursued over the previous year. Former WABA director Eric Gilliland wasn't able to attend but wished WABA well in the future via video. Eve was several times the Hawaii Woman's State Road Racing Champion. She then used her longtime experience as a road cyclist and coach to teach and inspire new cyclists. Eve had that special spark of friendship that always made other cyclists feel at home, welcomed, valued and among friends. She was the heart of cycling in Honolulu. Many people owe their start in cycling to Eve’s positive encouragement. As you ride the 2010 Century, honor Eve by being kind to all cyclists, pedestrians and motorists. Remember that in our rides, large and small, we are all connected by care and respect for each other. Ride safe! Be like Eve and Ride Aloha! Advocacy Awards were given to Jack Cochrane, Chair of Montgomery County Bike Advocates (MoBike) for everything he does to make Montgomery County more bicycle-friendly, and Heather Deutsch, Bicycle Program Specialist, District Department of Transportation (DDOT) for championing the Metropolitan Branch Trail. A Volunteer Award was given to Jason Clock, WABA bike valet and events volunteer, and the first annual Pierre Summerville Education Award was given to Christine Gilliard, physical education teacher at Gladys Noon Spellman Elementary School in Prince George's County. The WABA board election was held, with four new members joining the board: Eric Fingerhut, Emily Littleton, Philip Lyon, and Mark Blacknell. 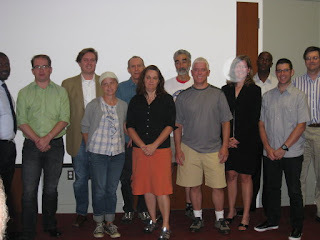 In the photo on the left board members include, from the left: (a partial) Randall Myers (Sec), Philip Lyon, Mark Blacknell, Dana Wolfe, Bruce Wright, Barbara Kleiforth (Pres), Paul D'Eustachio (Treas), Casey Anderson, Emily Littleton (sorry about the lens flare), Martin Moulton (VP), Eric Fingerhut, and Jim Titus. See the WABA website for more info on WABA board members. Today I had two meetings separated by about 25 miles; the regional Bike to Work Day meeting at MWCOG's offices in DC near Union Station, and the Tysons Bicycle Advisory Committee meeting at Fairfax County DOT offices in Fair Oaks. The ride this morning from Reston along the W&OD Trail to the first meeting downtown was uneventful until I crossed one of the many side streets in Falls Church, possibly N. Oak St. Just after crossing the street I felt something under my rear wheel. I looked back and there was a squirrel lying in the trail; somehow it had darted out onto the trail between my two wheels and I rolled over it. It scurried off into the brush so I'm hoping it was OK; it was not a good feeling knowing I'd possibly hurt the poor critter. Luckily I stayed upright. There was no time to react. After the meeting downtown I headed off to the second meeting. I had noticed earlier that my rear tire was very worn. I've found that the best way to prevent flats is to have good rubber on your tires. I was running late for the meeting and as I headed toward Cedar Lane on the W&OD Trail I heard an ominous hissing sound. Sure enough; rear flat. It was windy and I couldn't tell where the hole was and couldn't feel anything in the tire. Mistake number 2 (not changing the tire earlier was mistake number 1 if you don't count the squirrel incident which really wasn't my fault). Being in a hurry I put in another tube and rode away. I was getting closer but was already going to be late for the meeting. Then came the second rear flat. Fortunately I was carrying two spare tubes. It appeared that the rim strip was offset, exposing a spoke hole which could have caused the flats, but I still couldn't find a hole in the tube (it was still windy and I was in a hurry). I did finally make to the second meeting an hour late. Did I mention that because I was in a hurry I didn't eat or drink enough and bonked and was dehydrated? This ride is definitely on my worst ride of the year list. 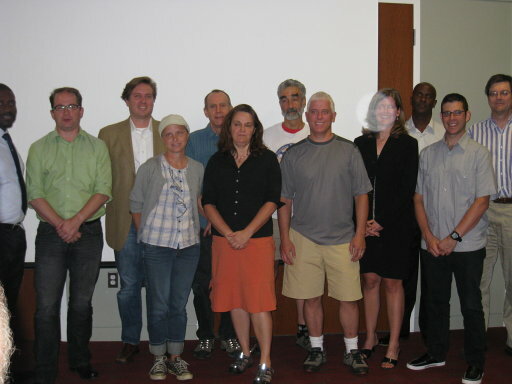 Now that the Tysons Bicycle Plan effort is underway, it's time to hear from area cyclists. A public meeting is scheduled for Thursday, September 30 from 7:00-9:00 p.m. at Joyce Kilmer Middle School Auditorium, 8100 Wolftrap Road Vienna, Virginia 22182 ( Map). The study area for this first phase of the plan is the greater Tysons area, communities in a 3 mile radius around Tysons. This includes McLean, Pimmit Hills, West Falls Church Metro station, Dunn Loring Metro/Merrified, the Town of Vienna, and long sections of the W&OD Trail. If you want better bike facilities in these areas or want to hear how the county plans to make Tysons more bike-friendly, plan to attend this meeting. The Tysons Bicycle Advisory Committee will meet tomorrow, September 8 at 1:00 p.m. at the Fairfax DOT offices. The county plans to post information about the Tysons bicycle plan process. In the meantime, visit the FABB Tysons bicycle plan page. 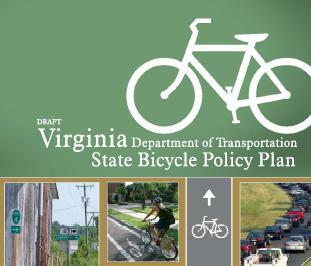 VDOT recently released the Draft State Bicycle Policy Plan. The Plan is intended to strengthen implementation of the 2004 Policy for Integrating Bicycle and Pedestrian Accommodations. The Plan will go a long way toward making Virginia more bicycle-friendly. We applaud the effort that has gone into producing the draft plan and recommendations and we look forward to its implementation throughout the Commonwealth. Allowing narrow travel lanes (down to 10 feet) to provide space for bike lanes (Action 1.3a). This is currently done in Arlington Co. and elsewhere with little impact on road capacity. Reviewing lane widths and capacity during new construction, reconstruction and resurfacing projects to provide space for bicyclists (Road Diets, Action 1.3b). This could lead to more projects similar to the one that created the Lawyers Rd. bike lanes. Improving routine maintenance by VDOT of state-maintained bicycle routes, shared use paths, paved shoulders, bicycle lanes, and other existing bicycle facilities (Action 1.7c). Better use of shoulder paving funds (Action 1.8a). Each VDOT District should have a bicycle advisory committee. This will improve communication between VDOT and area bicyclists and give bicyclists an opportunity to provide feedback on current problems and planned projects. VDOT should provide recommendations on bike parking and shower and changing facilities at buildings owned or occupied by the Commonwealth of Virginia. 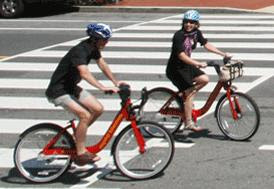 VDOT should also encourage use of bicycles by state employees to be a model for businesses and other organizations. VDOT should encourage more people to use bicycles for short trips by providing public service announcements, fact sheets, and other encouragement materials. VDOT should track and make better use of the 2% of maintenance funds dedicated to providing paved shoulders for bicyclists. Two-foot shoulders are not sufficient for bicycle travel. The minimum should be increased to three feet, with four feet being the preferred width. Comments can be submitted via e-mail to vabiking@vdot.virginia.gov until Friday, Sept. 17, 2010. 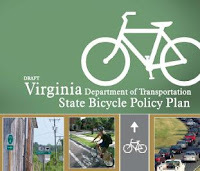 See FABB VDOT Bike Plan Comments for our detailed comments. Bike Charlottesville is "a new coalition of cycling clubs, advocacy organizations, retailers, employers, and individuals from in and around Charlottesville dedicated to promoting safe cycling in the region." They recently conducted a survey (the Bike Ballot) of Charlottesville cyclists to "identify areas of concern and potential solutions to the area’s cycling challenges." CHARLOTTESVILLE, VA: With increasing numbers of residents choosing cycling for transportation and recreation, Bike Charlottesville conducted an important community survey to identify areas of concern and potential solutions to the area’s cycling challenges. Please join Bike Charlottesville along with local government officials and civic leaders from the City of Charlottesville, County of Albemarle, and the University of Virginia for the release of the survey results and a brief discussion on what steps the community can take to make our streets safer for bicyclists. This event is open to the public and will be held on City Hall Plaza on September 9th, 2010 beginning at Noon. The City of Charlottesville will provide a location for live broadcast vehicles and several participants will be available to speak individually to the news media immediately following the event. Visit the Bike Charlottesville Facebook page. Update, 10Sep2010: Read about the press conference yesterday announcing the results of the Bike Ballot. WABA's annual membership meeting will be held on Thursday, September 9 at Mount Vernon Place United Methodist Church, 900 Massachusetts Ave. NW, Washington, DC 20001 (map) starting at 6:30 p.m. Meet WABA's new Executive Director, Shane Farthing, and hear about his goals for WABA's future. RSVP. FABB attended the James Madison High School Fall Kickoff Festival this week along with John Brunow (in green t-shirt) of bikes@vienna and Charlie Strunk (dark polo shirt), County bike coordinator. We talked to students and parents about the benefits of biking to school. John provided free tuneups and brought his event racks for student bike parking. There is a great potential for bicycling at Madison given Vienna's mostly bike-friendly grid of streets. A few kids were interested but we mostly talked to adults and handed out copies of the county bike map. 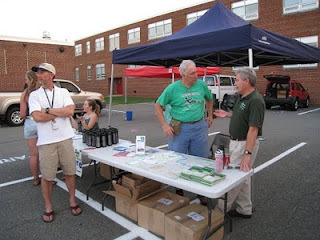 We also talked to Mr. Gongaware (on the left above), the Environmental Club faculty advisor. He thinks interest in bicycling is gaining, that kids are more open to using bicycles for transportation. Unfortunately most of them have never received any bicycle education, and likely have never been encouraged to bike to school. If there's interest, we may attend an Environmental Club meeting to discuss the benefits of using bikes as part of the transportation system. A candlelight vigil is planned for 7:30 p.m. Wednesday in remembrance of Rebecca Johns, the nine-year-old Fairfax County girl who was killed Monday night when she was hit by a car while trying to cross Franconia Road. Johns, who lived on Clermont Drive, was with two teenaged girls on bicycles about 4:30 p.m. Monday. The two older girls crossed Franconia Road near Cannon Lane, but Johns was hit by a 2004 Mercury sedan driven by an 80-year-old Alexandria man. Rebecca was taken to Inova Fairfax Hospital, but died a short time later from her injuries. The driver stayed at the scene and was not charged. Police do not believe speed or alcohol were involved. The vigil will start at 7:30 p.m. at Wilton Woods Memorial Garden, 3800 Ivanhoe Lane, just south of Franconia Road.